We’ve shown you some fabulous kindergartens over the years but these pre-schools are enough to make you wish you could enrol your child for a semester of kinder in each of France, Israel, Germany and Slovenia. 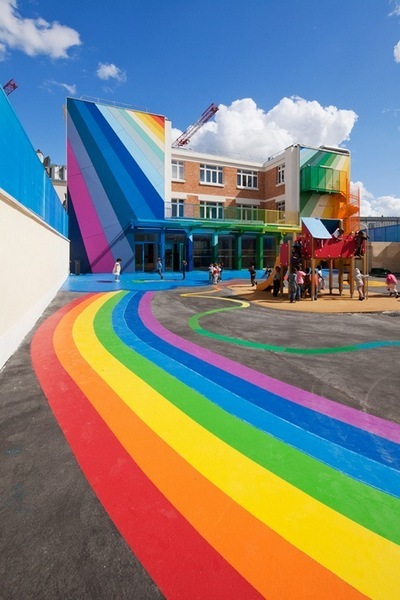 A riot of colour, the Ecole Maternelle Pajol, in Paris puts the rainbow in every kindergarten day for its lucky French students. The colour isn’t confined to the exterior. Inside, spaces have a playful feel with coloured tiles, flooring, glass and wall murals making every room eye-popping. In start contrast, is the understated style of the Ramat Hasharon kindergarten in Tel Aviv, Israel. Designed around the classic Bauhaus principle of form follows function, the space is a superb combination of calming and playful. Also in Israel is the Three Elephants Kindergarten in Caesarea. Although we couldn’t get a peek inside, the distinctive exterior is enough to put this kinder on my list of favourites. 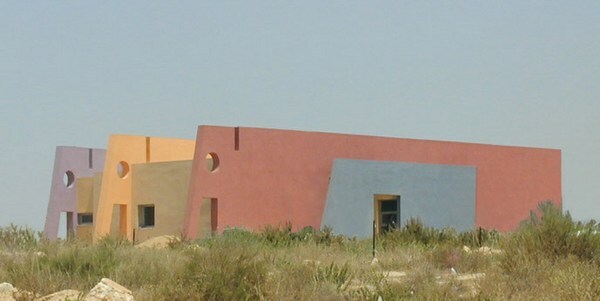 In the context of its surrounds, the kindergarten really does appear to be three elephants traversing the dunes of Caesarea. 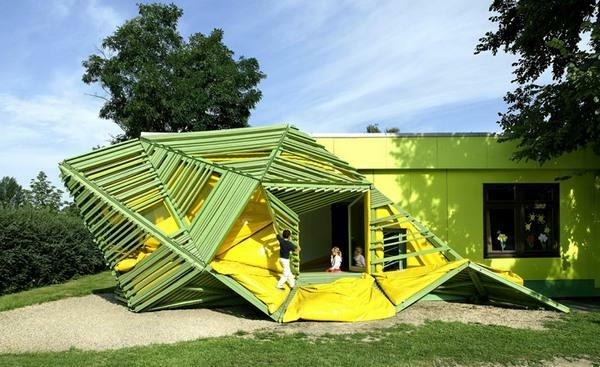 It’s hard to believe that the Taka-Tuka-Land Kindergarten in Berlin, Germany was only ever intended to be a temporary building – it would have been such a shame to lose such an unusual space but thankfully the kindergarten was so successful, the building was saved. It has unique padded entry and exit points (giving new meaning to ‘tumbling’ outside) and was inspired by the classic tale of Pippi Longstocking and her visits to the mythical Taka-Tuka country. 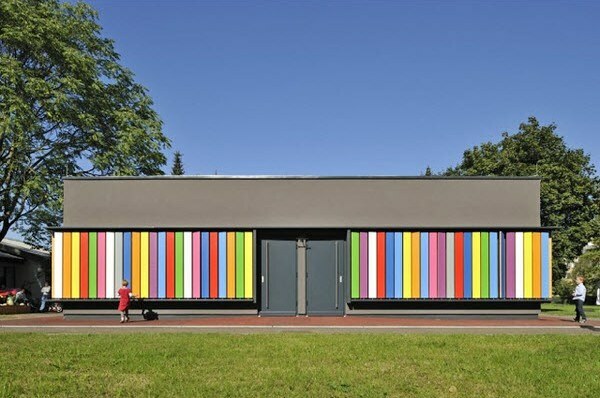 Rounding out the top five is my very favourite – Kindergarten Kekec, located in Ljubljana, Slovenia. 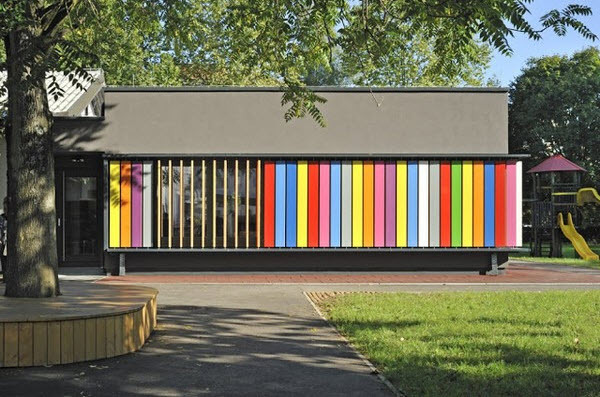 The kindergarten architects created rotating pre-fabricated wooden panels for the exterior walls – natural timber on one side and a rainbow of colours on the other. The panels allow the children to constantly change the appearance of their kindergarten and the result is nothing short of spectacular.